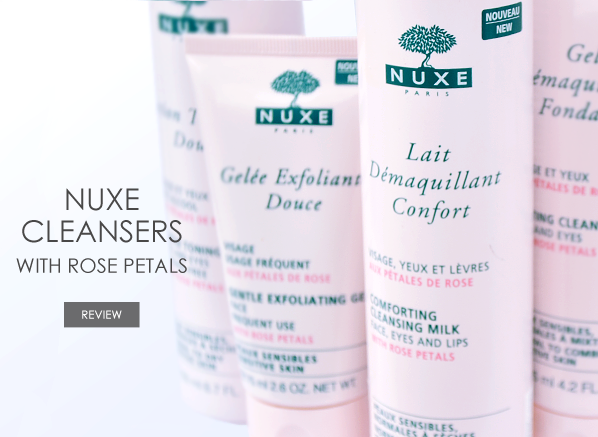 Designed with sensitive skin in mind, the Nuxe Cleansers with Rose Petals collection is a comprehensive range of daily make-up removers, skin balancers and complexion refiners. Its core composition is made up of rose petals (no points for guessing that one right! ), which works wonder for calming redness and boosting moisture, alongside allantoin for soft and radiant skin. As the cleanser collection is fantastically thorough, we thought that you may need a little help choosing the right formula for you. Take a look at our rundown of the different uses and textures below, and then click through to shop the entire range with 1/3rd off RRP for the whole month of October! 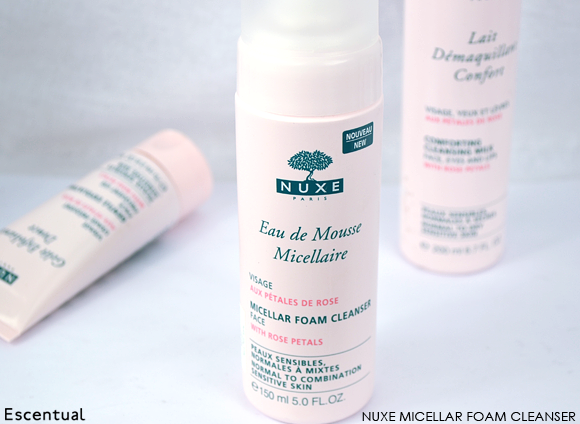 Designed for combination skin types who want the cleansing prowess of a foam without any of the associated tightness or dryness, the Nuxe Micellar Foam Cleanser is a bubbling face wash, but not as you know it. 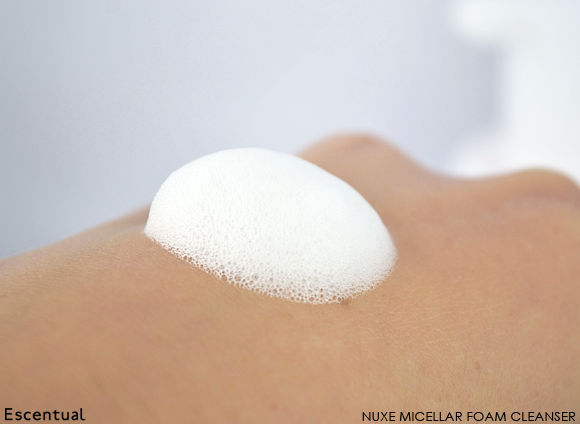 Free from soap, the smooth and dense foam removes impurities and makes skin feel really clean with its gentle micellar surfectants. 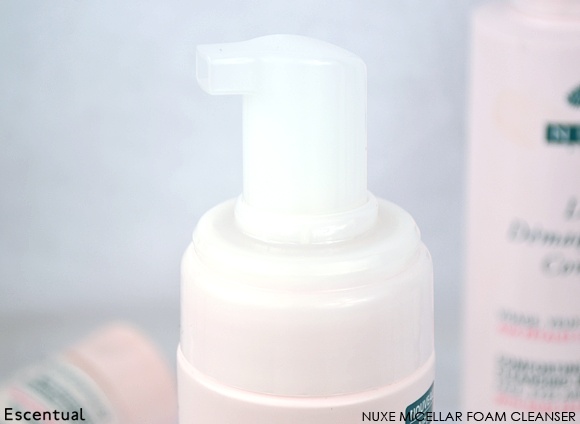 The Foam Cleanser starts off as a liquid, but is dispensed as a foam as the pump action of the bottle froths it up. One pump is enough to cleanse the entire face as the foam is pretty dense. Here’s around half a pump – and it’s still pretty generous! Massage onto moistened skin to produce a lovely lather and let the micellars do their thing, removing impurities and daily grime. The skin is left feeling fresh and clean, while rose petal water and allantoin provide softness. Who is it for? Normal to combination skin types who want something fresh and effective. It’s perfect for use in the morning or in the shower. 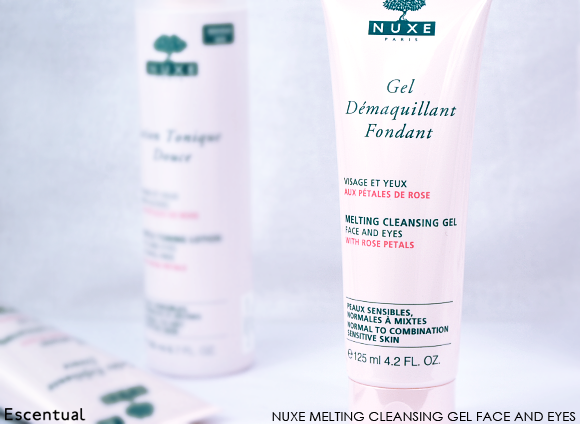 The newest addition to the Nuxe Cleansers with Rose Petals family is the Melting Cleansing Gel, a balancing wash for normal to combination skin types. Like the Micellar Foam Cleanser, it’s designed for those who favour freshness over nourishment when cleansing. Unlike the Foam, however, this one is designed specifically with make-up removal in mind. Though the texture of the Melting Cleansing Gel is quite rich, it emulsifies beautifully with water to create a refreshing milk-gel hybrid. Its base is made with gentle a gentle coconut derivative to melt away make-up effortlessly, while added macadamia oil protects the skin from dryness without overloading it. Who is it for? Normal to combination skin types who want to make sure all of their make-up is gone in the evening, but don’t want their skin to feel oily or sticky. 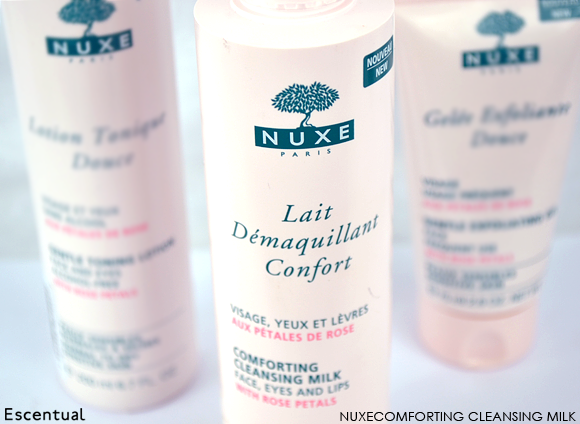 At the other end of the spectrum we have the Nuxe Comforting Cleansing Milk, a cleanser built for nourishment. The rich and protecting milk has a wealth of caring ingredients, from cotton oil derivative and coconut oil, to macadamia oil and rose petal water. The Comforting Cleansing Milk actually falls somewhere in between a cream and a milk; it’s got more substance to it, and definitely requires more massaging than your standard milky cleanser. Like the Melting Cleansing Gel, it’s great at make-up removal, and can be used on the eyelids to dissolve mascara and liner. Who is it for? Dry to very dry skin types who need their cleanser to work a bit harder in the moisturising stakes. Perfect for both morning and evening, you can cleanse and go in the AM, and spend more time massaging to remove make-up at night. 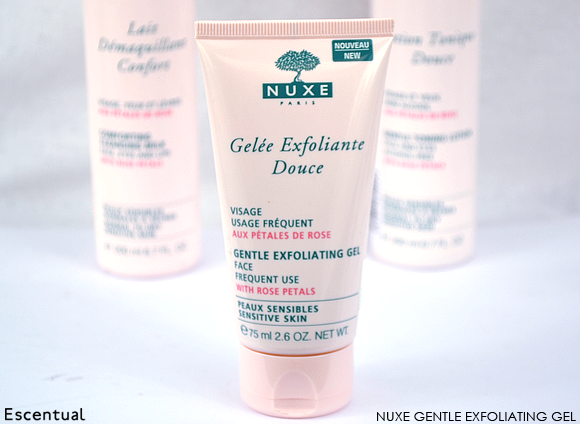 The Nuxe Gentle Toning Lotion is all about redressing the balance after cleansing. The soft, alcohol-free formula is made up of four key ingredients: Damascene rose water for softness, coconut derivative for gentle cleansing, witch hazel water to smooth and hyaluronic acid to give skin a moisture boost. Apply to a cotton pad and sweep around the face to catch leftover cleanser, and once more to infuse the wonderfully soothing, softening and plumping ingredients into the skin. 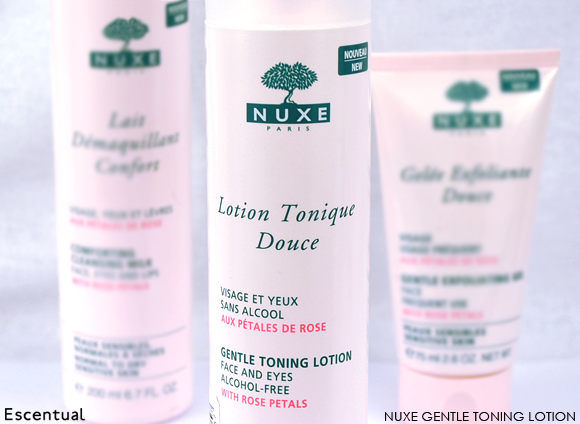 Like all of the Nuxe Cleansers with Rose Petals, its delicate rose scent makes cleansing a lovely ritual. Who is it for? Perfect for all skin types, particularly dry and sensitive, this toning lotion is an ideal finishing touch to give skin an added boost before moisturiser. All skin types should exfoliate once or twice a week to renew and refresh the skin, but the process can be stressful for some skin types. 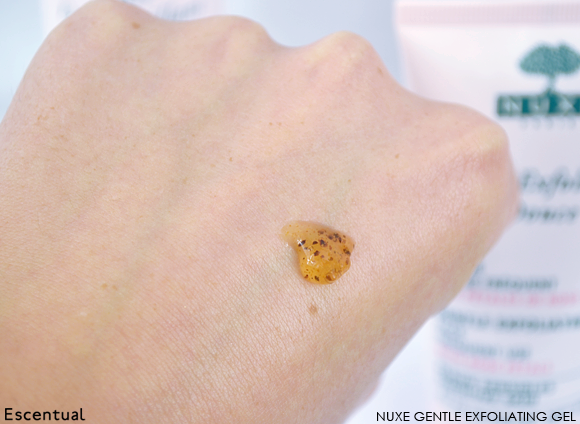 The formula of the Nuxe Gentle Exfoliating Gel is specifically designed for those who experience sensitivity, and works to gently polish the skin without causing irritation. The 100% botanical exfoliant is made up of lychee seed and nutshell powder to sweep away dead skin cells effectively. Added clarifying power is provided by rosemary water, ensuring that the complexion feels really fresh after use. Who is it for? All skin types, particularly sensitive, who want a frequent use exfoliator that doesn’t make skin protest. 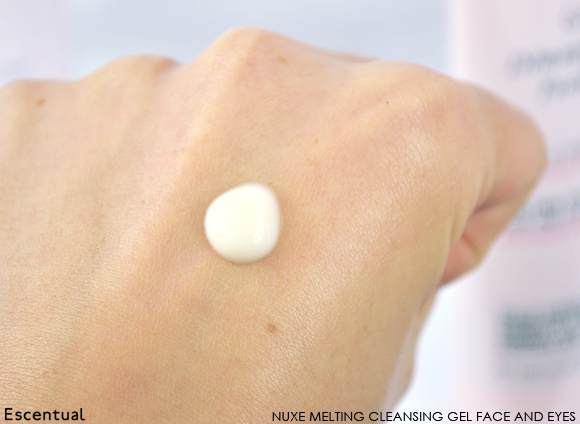 Mix with your favourite Nuxe cleanser for cleansing and skin refinement in one step (but be careful to avoid the eye contour!). 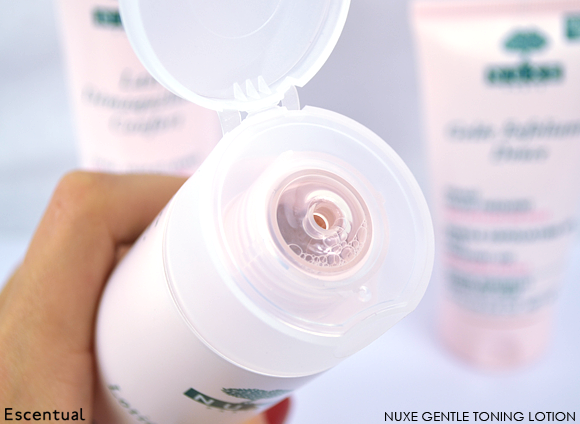 Great - just what I would expect from Nuxe, a fantastic product. This entry was posted on Tuesday, October 15th, 2013 at 9:00 am and is filed under French Pharmacy, Skincare, Swatches, Tried & Tested. You can follow any responses to this entry through the RSS 2.0 feed. You can skip to the end and leave a response. Pinging is currently not allowed. These are amazing Emma, thanks so much for recommending them and I’ll be sure to pick at least one of these products. I do feel that the scrub isn’t suitable for any skin, sensitive especially due to the shell powder. The particles of the shells aren’t spherical – they’re irregularly shaped and pointy. They scratch the surface of the skin which results in microdamage. I prefer using BHAs and similar chemical scrubs in the form of toner or cream.